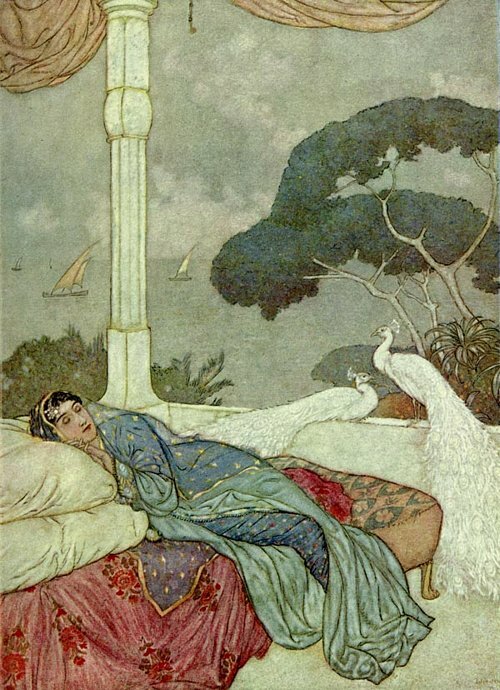 The ultimate fairy tale master, Edmund Dulac must be one of the most influential and purely gorgeous illustrators around. His version shows a sensitivity to the ‘Oriental’ feel of the poem whilst providing a ‘Occidental’ fairy-tale spirit as well. Originally Hungarian, Pogany’s illustration here shows a greater interest in realism in the human figures and a desire for a striking pastel atmosphere. René Bull expresses what to me is perhaps the ideal mood, colour-scheme and imagination for this poem – there is a richness, detail and passion to his art that I cannot resist. 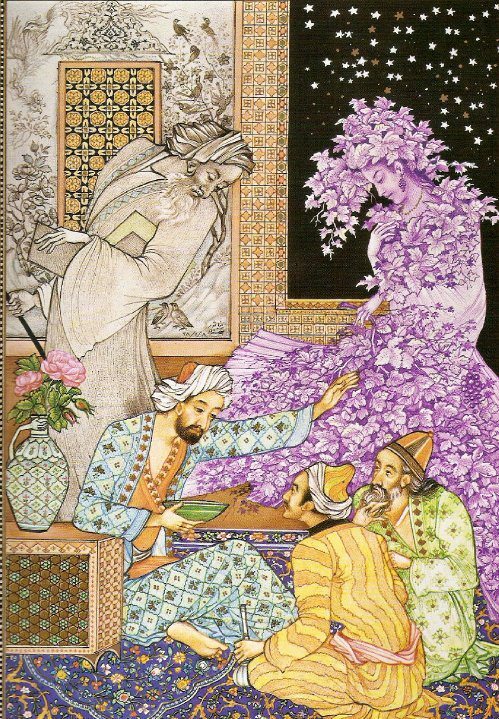 A Persian illustrator who knew more than the translation of the poem at hand, Behzad’s art is strikingly colourful, the human figures very much in an eastern style and the lively patterning and decorative features in the scenes bring the illustrations to life. There is something slightly serious and slightly yearning about Elihu Vedder’s work on the Rubáiyát, with its lush full-book design. He lost several children in a short time before working on this book and Khayyam’s message struck him deeply and personally, lifting his spirits. 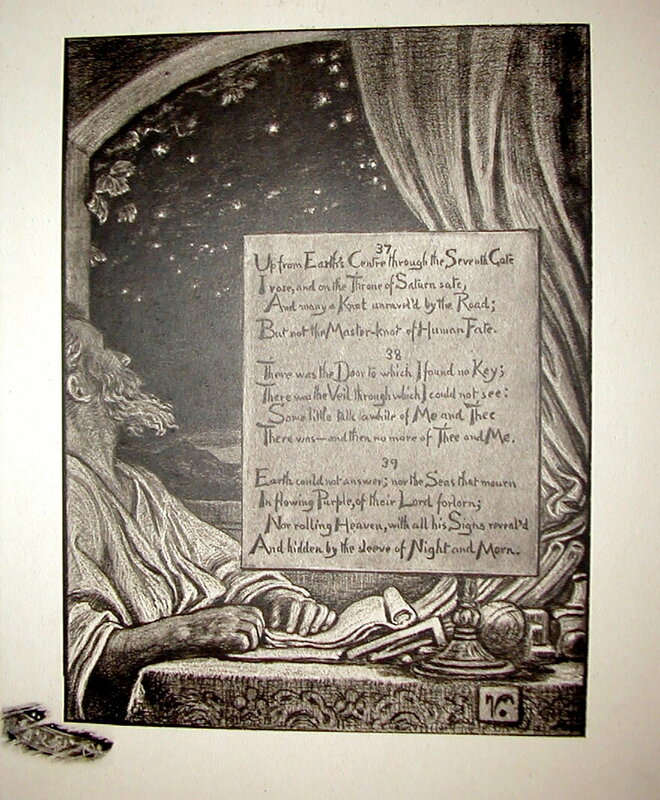 It is also the first full illustrated edition of the book, published in 1884. 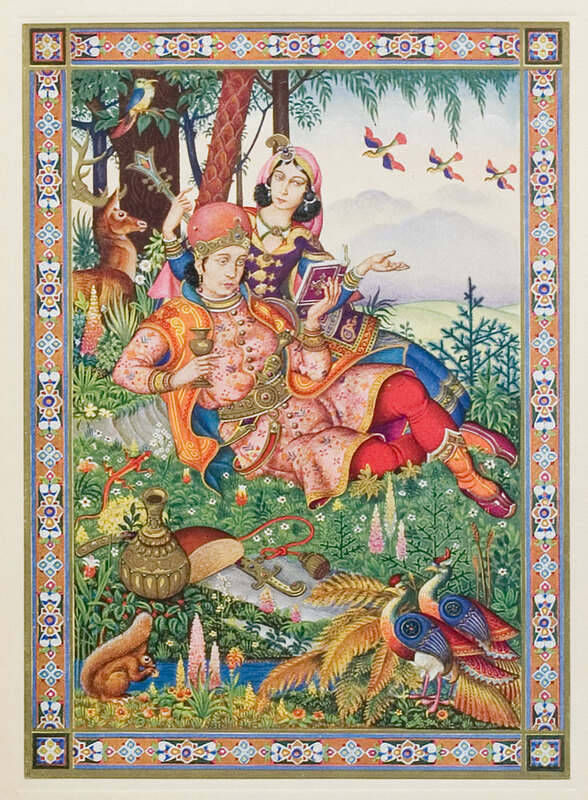 Arthur Szyk’s pictures seem to reflect a fascination with Persian design (e.g. the rug-like borders) and lavishness of colour – perhaps a little lacking the strength of colour-focus and light/dark contrasts that I personally prefer, but a distinctive approach nonetheless. 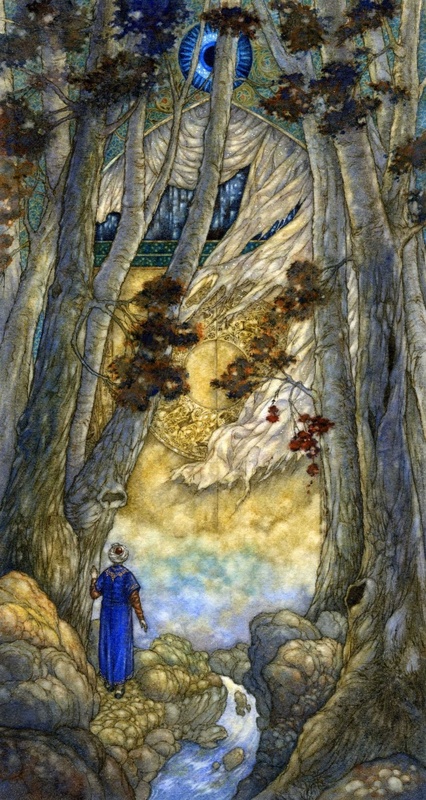 I find Charles Robinson’s borders charming and imaginative. His illustrations are less on the symbolic or allegorical side of things and quite immediate, with some lovely detail all over. 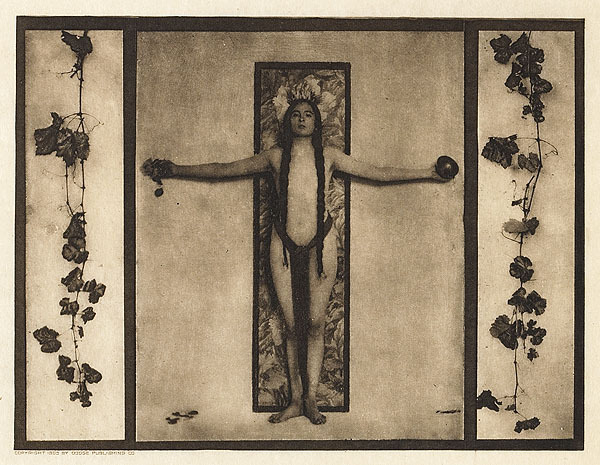 Adelaide Hanscom’s is certainly an interesting one – fusing some art nouveau decorative features with photographic images brings a unique approach to illustrating the Rubáiyát. Personally, I find there to be a stiff self-consciousness about the work that detracts from the liquid, lush and layered effect of the poem. 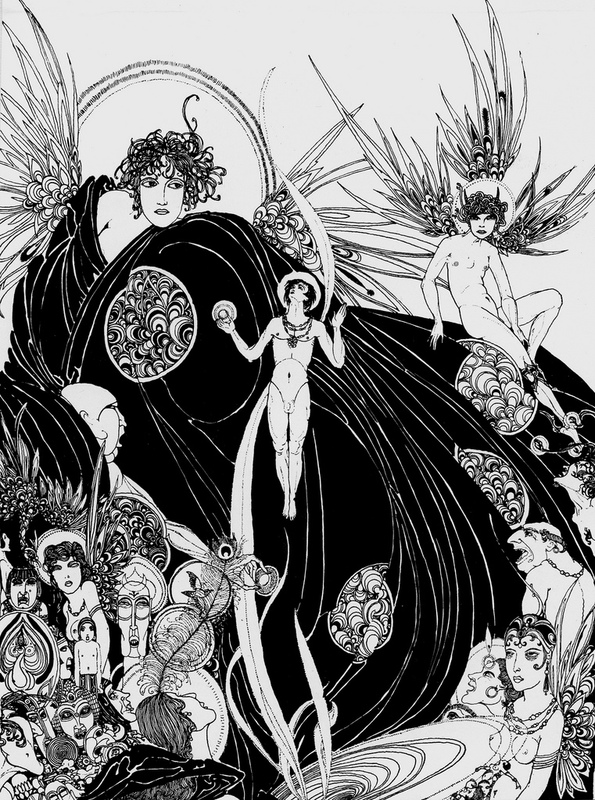 Too little of the Persian origin of the poem is remembered in Ronald Balfour’s Beardsley-esque interpretation but there is a whimsical abstraction about the approach. 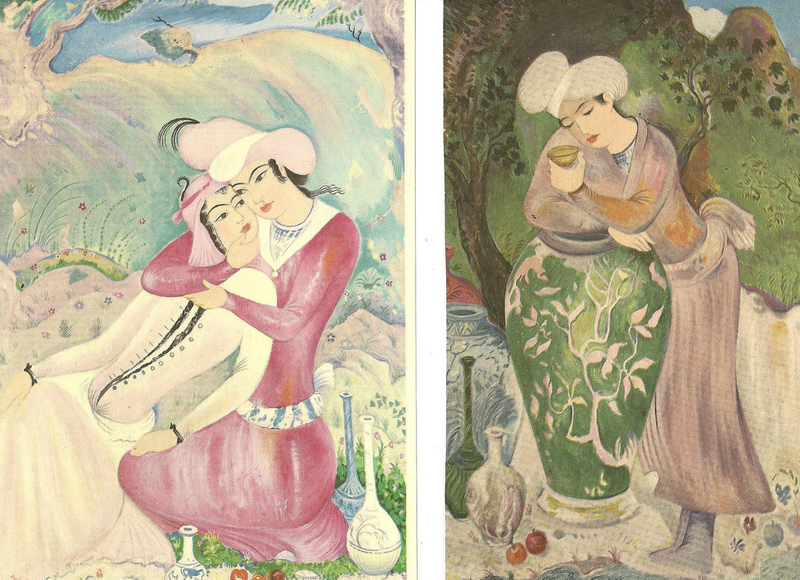 Katchadourian on the other hand is vividly inspired by Persian art, being Persian/Armenian himself. There is a masterful fluidity about his style. The most recent artist I’ve chosen to include can be found at this livejournal. 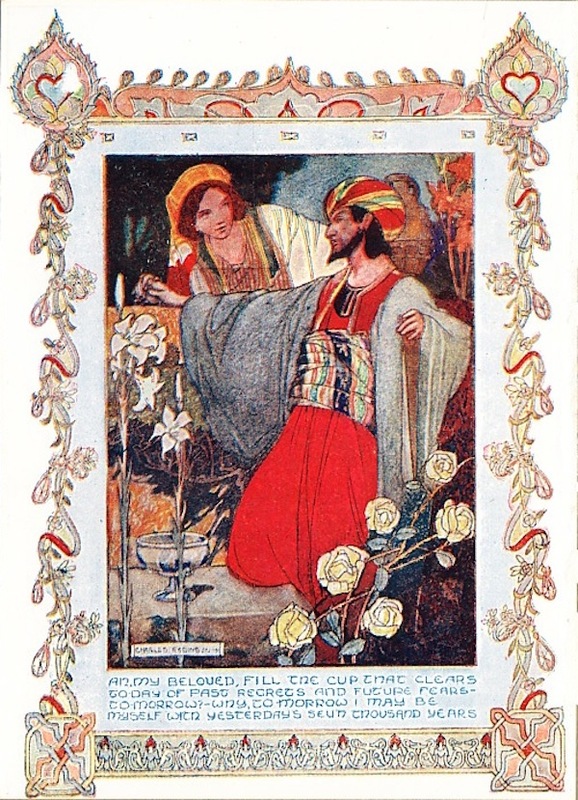 Clearly inspired by Dulac and René Bull, the artist also brings a distinctive vibrancy of fabric movement and colour (the use of blues throughout the illustrations for this edition remind me of the recurrent use of that unforgettable blue in Giotto’s Arena Chapel). I think it is obvious that the Rubáiyát inspires visual artists in exciting, nostalgic, yearning and intriguing ways. 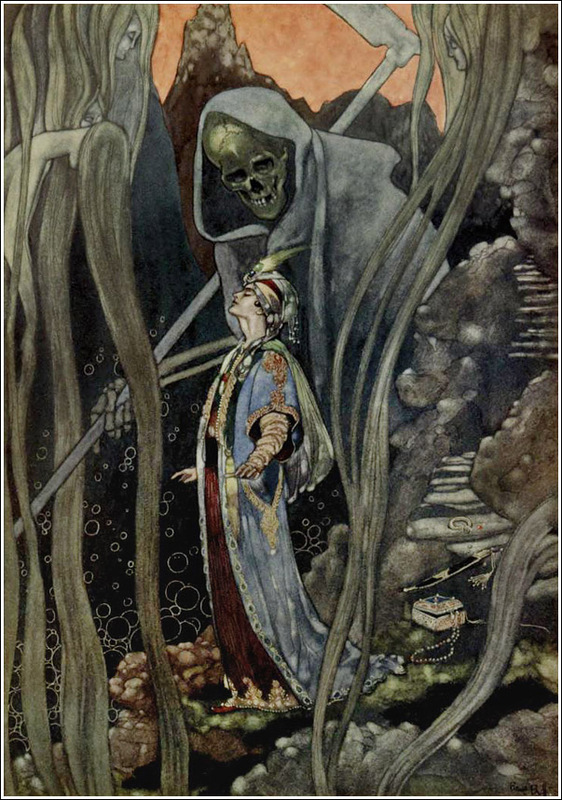 I can’t really pick a favourite, although I am partial to Dulac and Bull in particular. I’d be interested which illustrators others favour.